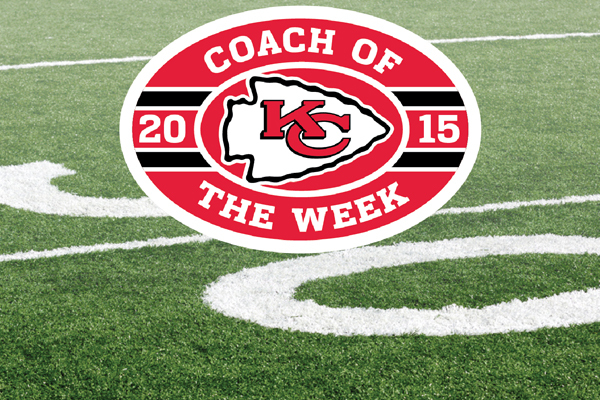 The Kansas City Chiefs have announced the Coach of the Week honors for this past week. The awards go to Steven Jackson of Harmon and Fred Bouchard of Staley. As a result of this honor, both schools will receive a $500 grant. Additionally, Jackson and Bouchard will be presented with congratulatory footballs autographed by Chiefs Head Coach Andy Reid and a certificate recognizing their selection. Each coach is now a finalist for their state’s Chiefs Coach of the Year Award. The 2015 High School Coach of the Week program is a joint initiative of the Kansas City Chiefs and the National Football League. This program is designed to recognize and reward Kansas City area high school coaches for superior performance on a weekly basis. The Chiefs Coach of the Week program is intended to honor individuals who are shaping today’s youth and tomorrow’s leaders. Harmon beat Topeka Highland Park 30-26 for its first win of the season. The victory also broke a 31-game losing streak dating back to the 2011 season. Jackson said this award is a direct reflection of the work put in by his players and fellow coaches. “I appreciate the honor of being named coach of the week by the Chiefs organization,” Jackson said. “My coaches and athletes have committed themselves to constant improvement day in and day out and this acknowledgment is a great indicator of success to come to Harmon football program. Staley is off to a 4-0 start and is one of the top teams in the Metro again this season. The Falcons beat Liberty North 21-0 in a game that stretched over two days due to inclement weather. Staley’s starting defense has yet to give up a point this season and the team has allowed just 24 points in four wins over North, Raymore-Peculiar, Blue Springs and William Chrisman. Bouchard thanked the Chiefs for the honor and for supporting high school football.